Summer 2019 Internship at SPARC! In partnership with the Getty Foundation. - SPARCinLA We are SPARC: Art | Community | Education | Social Justice SPARC | Social & Public Art Resource Center | Creating Sites of Public Memory Since 1976 | Founded by Judy Baca, Donna Deitch & Christina Schlesinger | SPARC is a community cultural center that creates public art as a vehicle to promote civic dialogue, foster cross-cultural understanding, and address critical social issues. We accomplish our mission by producing, preserving and presenting community-based public art. SPARC is a facilitator Ð finding ways to tell richly textured stories that help community participants and artists achieve a measure of change and transformation. through the Getty Marrow Undergraduate Internship Program! SPARC has partnered with the Getty Foundation’s Undergraduate Internship Program since 2010: Aiming to increase diversity in and provide support for Los Angeles-area museums and visual arts organizations, the Getty Marrow Undergraduate Internship program has funded substantive, full-time summer work opportunities for students at Los Angeles-area museums and visual arts organizations. 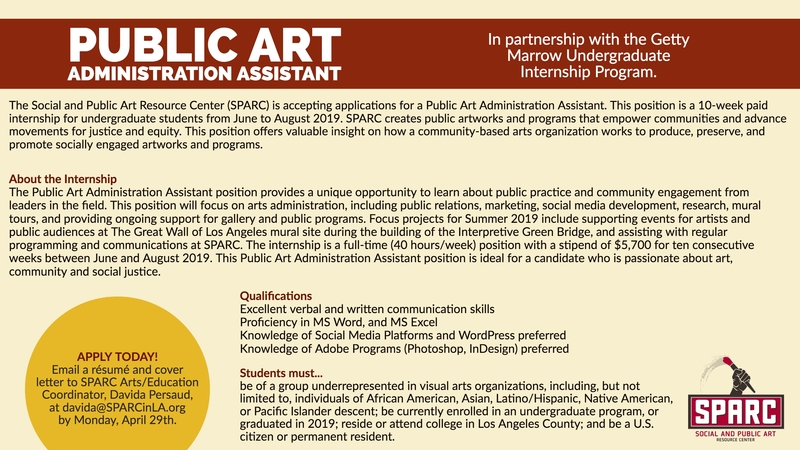 Undergraduate students who reside or attend college in Los Angeles are encouraged to apply for a Getty Internship at SPARC by emailing a résumé and cover letter to Arts/Education Coordinator, Davida Persaud, at davida@sparcinla.org. Please email or call (310) 822-9560 with inquiries.